The Desert Oasis Aces continued to roll through the American Legion Western Regional on Friday, as Jimmy Gamboa pitched a six-hit shutout in a 12-0 victory over League City (Texas) in Denver. The Desert Oasis Aces continued to roll through the American Legion Western Regional on Friday, as Jimmy Gamboa pitched a six-hit shutout and Chaison Miklich had three RBIs in a 12-0 victory over League City (Texas) in Denver. Through three games, Aces pitchers have thrown 21 innings and allowed one earned run for an ERA of 0.33. Desert Oasis has outscored its opponents 23-2. The Aces’ offense struck early and often Friday, scoring a run in the top of the first and two in second. They added one in the fourth, three in the sixth and five in the seventh. Zac Czerniawski scored three times, and Parker Schmidt, Jason Sharman and Edarian Williams each scored twice. Colby Smith doubled and drove in two, and Steven Giatti had two RBIs. 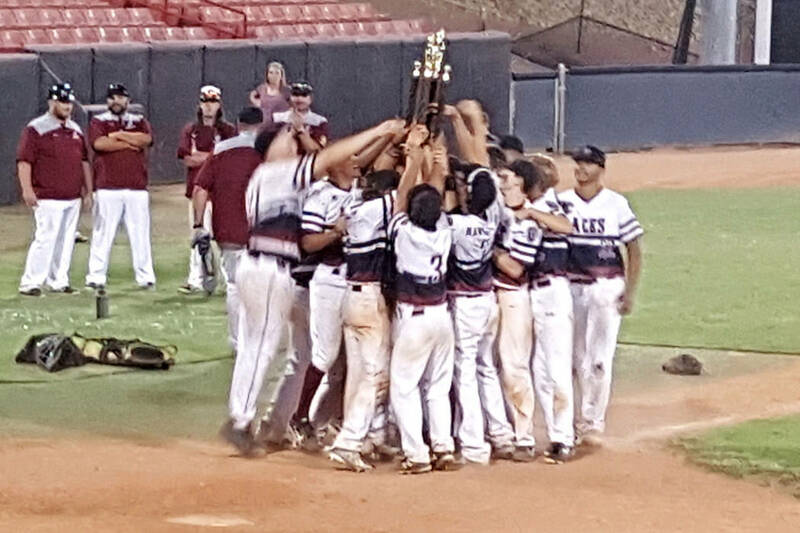 Desert Oasis is two wins from the region championship. The Aces play Tucson (Arizona) at 6 p.m. Saturday, and the championship game is scheduled for 11 a.m. Sunday, with a second game at 2:30 p.m. if necessary. A loss Saturday would not eliminate them from contention. Game 12 — League City (Texas) vs. Petaluma (Calif.), 2 p.m.
Game 13 — Tucson (Ariz.) vs. Desert Oasis, 6 p.m.
Game 14 — Winner Game 12 vs. Winner Game 13, 11 a.m.